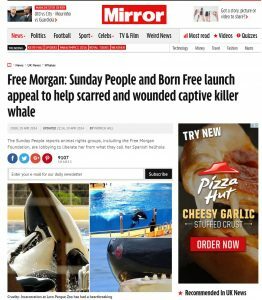 Many newspapers (including online versions) & magazines have run articles about Morgan. 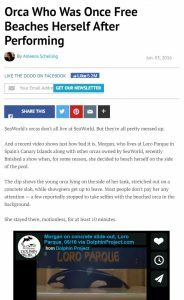 From her capture to her incarceration in the tiny tank at Dolfinarium Harderwijk, her move to Loro Parque and her plight since she has been there, Morgan’s story has been published in a range of languages. 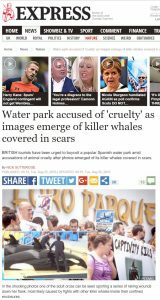 We present just a few of the articles here. 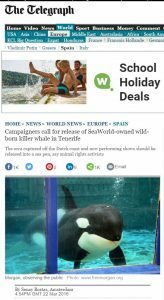 ‘She looked like she was trying to take her own life’: New calls for SeaWorld killer whale in Tenerife to be released back to the wild after shocked tourists film her beaching herself while she was supposed to be performing tricks.